Our artists in residence celebrating the launch of BLOC, our new arts programme. Suffolk Libraries has officially launched its exciting new arts programme. The launch was also the culmination of a week-long ‘Culture Lab’ at Ipswich County Library, where ten artists explored different media with the theme of Arts in the Community. The new programme has been named BLOC – ‘Building Libraries on Creativity’ - with the different themes of Arts and Creativity, Film and Digital, Literature, Music and Dance and Wellbeing and Inclusion. We worked with Bury St Edmunds based ‘Off the Press Collective’ and young people to come up with something they could identify with. Two events took place at the library last week where anyone interested in the programme had a chance to meet the artists involved and find out about their work and the new BLOC programme. Representatives from Arts Council England, the Department for Media, Culture and Sport, local arts organisations and the Suffolk Libraries Board also came along. As of April 2018, we have National Portfolio Status, which was awarded to six library services by Arts Council England last year. National Portfolio Status means the Arts Council considers an organisation is doing work of national significance. They awarded us over £700,000 to carry out this work over four years. 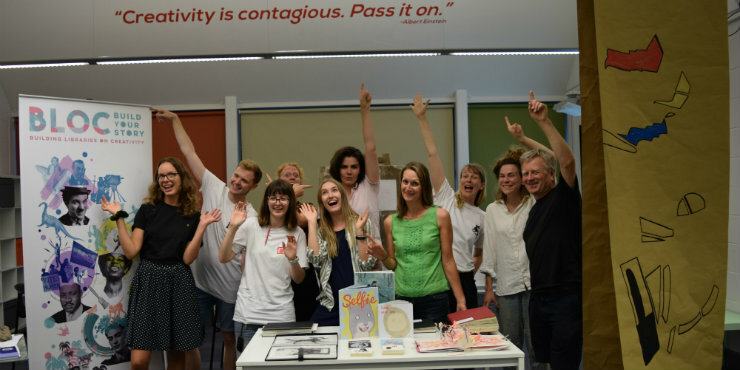 As part of Year 1 of the programme, we invited ten local artists to take over Ipswich County Library for a week to explore the role creativity plays as a catalyst for nurturing confidence and wellbeing in young people. The residency, which ran from Monday 30 July, also explored the role of the arts in the community and provided the artists with a chance to develop their own ideas and practice. The artists also visited, learned about and creatively responded to the communities which surround our other libraries on a ‘Library Safari’. Suffolk Libraries arts programmes coordinator Melissa Matthews added: “We decided we wanted our first artist residency to explore the role of arts in the community and how being creative can be used as a catalyst for bringing communities together and to support wellbeing in young people (11–25 years).